Narendra Desai is the greatest astrologer that I have ever had the pleasure of meeting. The Following is a collection of memories of my interactions with Narendra, who was one of my Jyotish teachers, and also little vignettes of Narendra in action that I observed firsthand. I first met Narendra in Fairfield, Iowa in either 1991 or 1992. I was already a practicing jyotishi. There was a group of about 6 to 8 of us who had taken several courses from Hart de Fouw (my main Jyotish teacher). We all loved Jyotish. And it seemed like Hart was not planning on coming to Fairfield again. So, when I found out that Narendra Desai was coming to town, I was all excited. He gave an excellent talk on the Divine Science. Afterwards, I asked him if he would be willing to teach us. He agreed. And this is where our mutual journey began. Narendra, besides being a great master of Jyotish, was also an excellent palmist, numerologist and a good practitioner of Western Astrology. Furthermore, he was superb at rectifying charts by analyzing the right thumbprint. And he knew perfect Sanskrit. And he spoke several languages fluently - Gujarati, Hindi, Marathi and English. He had a law degree, but for most of his life he made a living from astrology. He was born and raised in Gujarat but after marriage he settled in Bombay. In the 1980's he moved to the United States. He settled in Parsippany, New Jersey. This is a town that is filled with Indians from all corners of Mother India. One of my friends, a woman on the same spiritual path as me, used to live in New Jersey. She had sponsored a very famous, but rather young, Nadi leaf astrologer. His schedule was packed. Then, one day, he told her "Cancel all my appointments today. The greatest astrologer in all of India is coming to see me today." And that someone was Narendra. Later, on Narendra's second or third trip to Fairfield, someone was showing him around town. Narendra said of Fairfield "It is a small Indian town in the American Midwest." Then the guide introduced him to a team of professional Indian astrologers who were then in Fairfield. They all bowed down to Narendra, and held out their hands to him and said, "Oh, punditji, please tell my fortune." In early 1993, Narendra was again in Fairfield. I desperately wanted a reading with him, but I could not afford it. So, I told him, "If you do this reading for me without cost, I will bring you at least 10 paying clients." And I did. I also helped clients prepare for their readings. I told them, "If you want to get your money's worth out of the reading, you must first have at least 30 questions written on a piece of paper." Because Narendra told his client's destinies based on what they asked. So, then it came time for me to have my reading. I only remember a few things about that reading (although I have a tape of it somewhere). I had started chiropractic college in 1983, but quickly dropped out because I could not stand to touch sick or suffering people. Their sick energy transferred to me and I got sick and they got better. Narendra said that I could do jyotish, or psychic work or counseling, or even some mental healing, but that under no conditions whatsoever should I touch people. I think that he said this because of my neecha Mars in the 7th house. Then I told him that I wanted to leave Fairfield and move to a big city to broaden my client base for Jyotish. I suggested New York, England, Russia, California, Chicago and Cleveland (my home town). He said that Cleveland would be best - and that is what happened although, at that time, I had no intention of moving back to Cleveland. Then I asked him about marriage - Should I get married? He said, "Yes, marriage would be good for you." 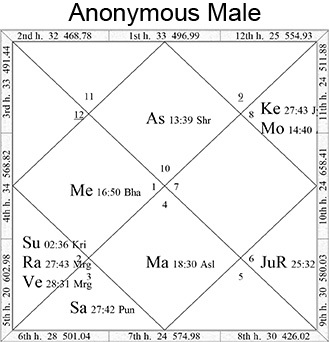 Other famous astrologers had looked at my chart and predicted no marriage. As I said, I have a neecha Mars in the 7th and the Moon, the ruler of the 7th house, is also neecha. So then I asked Narendra, what will my future wife be like? At that time, I had no girlfriend or relationship. He said, "Definitely blond; forget brunettes." I said, "What else?" He said that I had already met her but did not know that I knew her. All of this was true. "What else?" He said, "She will be a combination of the Moon, Mars and Jupiter. 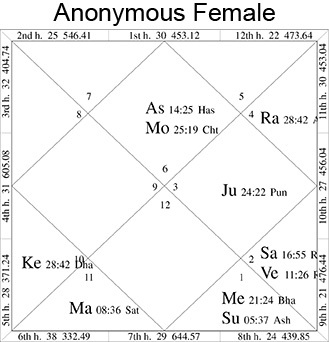 And in her chart, she has the Moon in the 1st house, Mars in the 6th (aspecting the 1st and 9th houses), and Jupiter is in the 10th house at the pinnacle of the chart. In 1994 there was an East Coast Vedic Astrology Conference in the Washington, D. C. area. Both Narendra and I and another famous Jyotishi I knew were to be speakers at the conference. When this other astrologer met Narendra, he bowed down to him and touched his feet. Narendra said, "Get up, man, what are you doing?" The other man said, "But, sir, your Sanskrit is so perfect." Now, this conference was held on a very busy 4 lane highway. There was a good Indian restaurant on the other side of this very busy boulevard, but there was no light or crosswalk to aid pedestrians. Narendra and I (who were roommates at the conference) often went to dinner together. Now, sometimes all the fast traffic frightened me terribly. But Narendra was fearless. Even though he had very thick lenses on his glasses (and without his glasses he was blind as a bat), he would boldly cross the highway every day of the conference. Once, I froze in the middle of the traffic. He said, "You must not stop. You must keep going until you get to the other side." This also could be a good lesson for life itself. Narendra's readings were often extremely accurate. 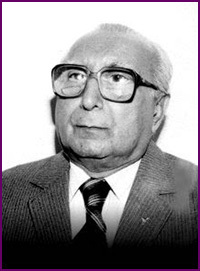 Even though he was a complete master of Jyotish, he had another technique that was more profound. When he would do a reading, he would look at the chart for about 5 minutes, and then he would take his glasses off and keep talking with his eyes closed while the client continued to ask him questions. His secret was this: he communicated with the spirits of famous dead Jyotish rishis - Bhrigu, Agastya and Shuka Deva. They would tell him everything about the client and his/her chart. In 1994, after I had moved back to Cleveland and gotten married to the woman that Narendra had so accurately described, Narendra came to Cleveland for about 2 weeks to do charts. I organized this for him and and he stayed with us in a suburb of Cleveland. 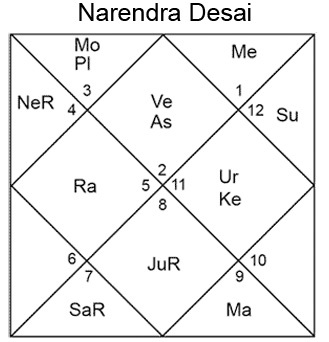 I had a 2nd chart reading from Narendra. The only thing I remember (although that tape is somewhere in the house) was asking him, "Should I go to India?" He was silent for about a minute and then said, "No, India will come to you." And it has been true. When I wanted to learn Sanskrit a wonderful young man with a Ph.D. in Sanskrit became the manager of the Hindu temple near our house. I wanted a Nadi leaf reading. I got 2 of them - both very profound - one in Fairfield, Iowa and the other in a suburb of Detroit, Michigan. I wanted to learn some psychic techniques - they occurred. Et cetera. While Narendra was with us in Cleveland, we hosted a dinner party for another Jyotishi - she was Indian. Accompanying her was her husband and a family friend. She recognized that Narendra was the real thing - at the top of the mountain of Jyotish knowledge. So, she asked him some questions. Narendra said, "Michael will answer." The question was something about Rahu and I answered that things would be better after transiting Rahu left her 7th house. Later, still in Cleveland, Narendra and I attended a monthly meeting of a Western Astrology association with about 15 to 20 people in attendance. Most of them were women. They just adored him and almost all of them wanted to hug him and touch him. One of the leaders of the group, a woman of about 38 years of age, asked Narendra to tell her about her profession. Again, he said, "Michael will answer." So, I screwed up my courage and looked at her chart and said that she seemed to be some kind of mechanical engineer. The answer was mostly true. Either her profession or her obsession was making and flying model rockets. Narendra, Mara (my wife), and I got along famously. What we had in common was we all had Mercury in Aries and Venus in Taurus. Also, we all had earth signs on the Ascendant. When Mara and I went to pick him up at the airport, he took one look at Mara and said that he felt as if he already knew her. I was very happy that he would be staying with us as I thought, "Oh boy, now I'll learn some hidden secrets of Jyotish." And I did learn a few, but only a few. What Mara and I did learn about was Indian cookery. The first place we stopped at after picking him up from the airport was an Indian grocery store. I remember that we bought rai (mustard powder) and Jal Jeera. Now, one of our favorite Indian foods was raita - sliced cucumbers in a spicy yogurt sauce. Narendra was fond of saying, "There is no raita without rai (mustard powder). Every week, he would eat pizza, seasoned of course, with a lot of extra black pepper." I remember telling him "You shouldn't eat all these hot spices because of your high blood pressure." He said, "I know, but I have to have them." And, also once a week, he liked Chinese food - usually vegetarian fried rice. Narendra was a very happy individual with a good sense of humor. One night we watched some movie featuring Chevy Chase wearing lederhosen. Narendra laughed so uproariously that it was contagious. He also knew a lot of English poetry and sayings. One thing that he often said was, "Never turn down a good offer." Also, there was a poem that went something like this - "Never trouble Trouble; Because if you do; Trouble will trouble you." Or something like that. It was an enlightening joy being around him. When we were together, I sometimes functioned as his organizer because he was so flowing, so transcendental. I am extremely grateful for having met him, and learned from him, and just being with him. (c) copyright 2017 Michael Laughrin.